I’ve been busy. I’ve been sick. The kids have been sick. It’s too cold outside to run. The roads are covered in snow. My friends won’t be at the gym. The excuses could go on and on, but my body is suffering from my lack of exercise. I can feel my energy level dipping not to mention my resistance to sweets is pitiful at the most. Winter is here and part of me just wants to bundle up and hibernate like a bear. Unfortunately, it doesn’t work like that for us mamas. We get no sick days, and we push through our circumstances to take care of our families. This post contains affiliate links. Clicking on a link supports the funding of my blog at little or no expense to you. Well, I have had enough of the excuses, and I’m ready to take action. I’m excited to share with you about Cosmo Body, an online fitness program that offers workouts, challenges and healthy recipes. The best part is you can try Cosmo Body for Free for 10-days. I know, you’re busy with the kids, work, and volunteering, but you can do this. I don’t want my exercising to take a back seat any longer, no matter how long my to-do list is. I am taking the 7-day Get Started Challenge. 7 workouts for 7 days, and none of the workouts are longer than 12 minutes, perfect for this any busy mama. I would love for you to join me in this challenge. A little competition always increases my motivation and accountability. It’s easy to get started. Just visit Cosmo Body to sign up for 10-Free Days. Once you are signed up you can check out this incredible site, but then head over to challenges and either start the 7-day Get Started Challenge with me or pick one that fits your needs. I understand life is busy, but my challenge to you is at least one workout a day. 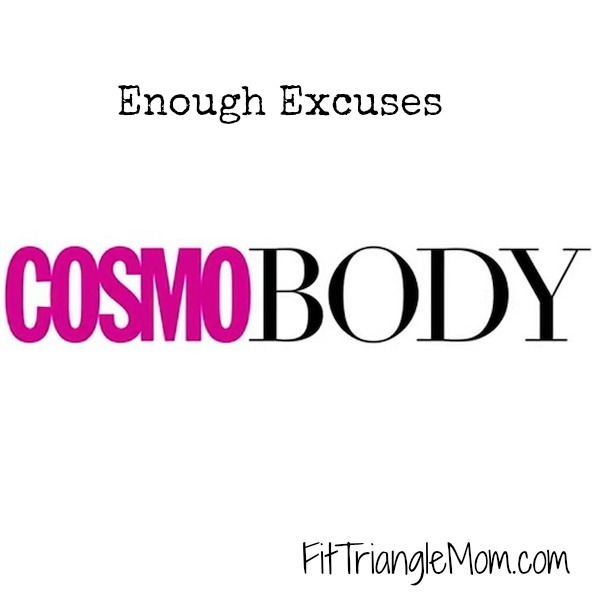 Let’s get rid of our excuses and start exercising! Plus, I’d appreciate it if you would share this post with a friend because accountability is the best way to stay motivated. Latanya, You’ll love Cosmo Body because the workouts will fit into your schedule and they will boost your energy. Thanks for commenting. Afraid of overdoing it. I am doing PiYo and running. Sounds like you are doing a great mix of workouts. Just remember to take “rest day” so you don’t overdue it. Thanks for commenting. The Cosmo Body program will be perfect for you. It’s online and they have lots of different workouts you can do at home. Thanks for commenting.